If you’ve been following along on our blog or our social media you may have noticed that some of our Explorers have been testing a lot of life jackets lately. And now you’re questioning – which one is for me? There are a lot of great options on the market and what works best for your dog will depend on what is most important to you. Here are our top picks based on our testing to date. Click on any of the links to read our full reviews. To earn the title of Best Overall Life Jacket we focused on three main things: does the jacket have adequate flotation; does it have a sturdy handle and sufficient belly panel for lifting your dog in and out of water; and are the quality of the materials and the construction of the jacket made to handle a dogs normal wear and tear. It was hard for us to pick just one jacket so we’re breaking the rules and choosing two! 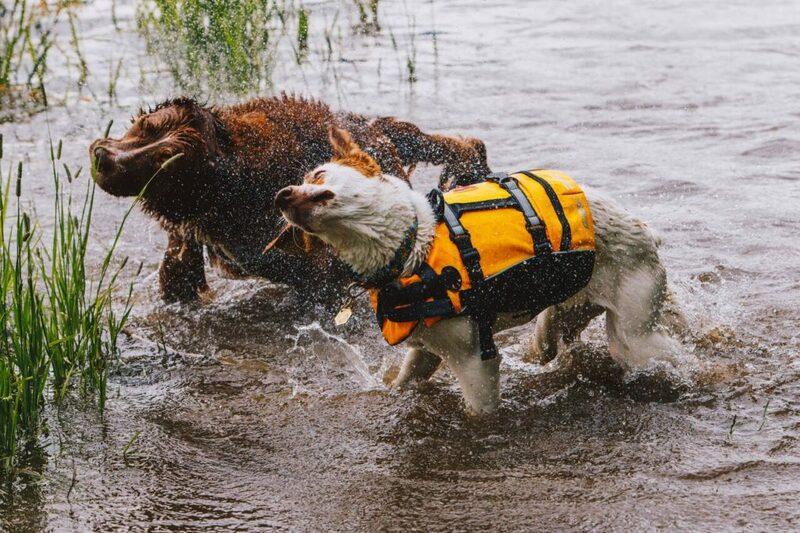 Hurtta Life Savior: Our current top pick for dog life jackets – this jacket checks off every box you could ask for – adequate flotation, full wrap belly panel, durable materials and a sturdy handle for lifting in and out of the water. After months of testing this jacket still looks as new as the day it arrived. A bonus for 2018 is that Hurtta has expanded the available colours of this jacket. Ruffwear Float Coat: A very close second and still worthy of the title Best Overall Jacket. The Ruffwear Float Cloat is a popular one with our dog friends and it’s pretty easy to see why – quality materials, great workmanship and will last for years to come. In addition, the grab handle on the medium was easily able to lift a 50 pound dog. The only reason it was slightly edged out by Hurtta as our top pick is the flotation wasn’t quite as strong in the lower half of the jacket. 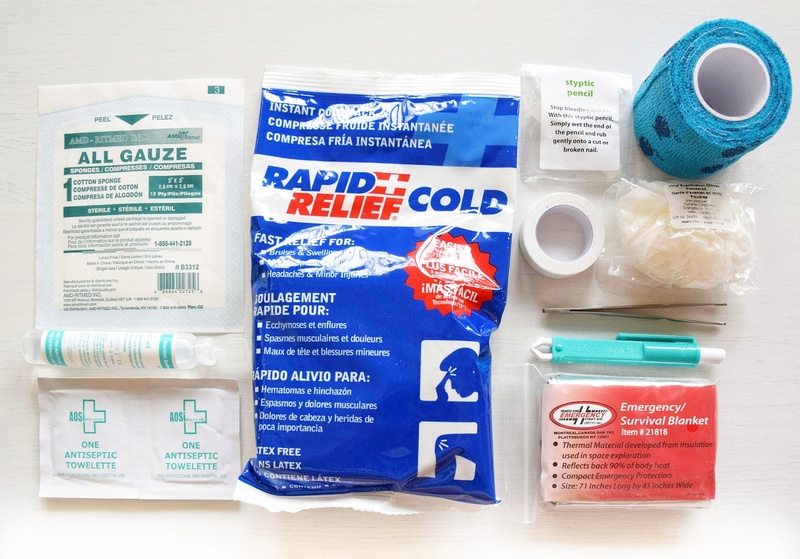 Not everyone has a big budget for their dog so we made sure to test some budget friendly options as well. Outward Hound Fun Fish Life Jacket: The Fun Fish life jacket may be written off as too cutesy but when put to the test it proved to have better sizing, better handle design, and sturdier belly/restraint system than it’s competitors at the same price point. If you’re looking for a budget friendly option as you aren’t sure how your dog is going to take to water we would recommend considering the Fun Fish Life Jacket. So your dog isn’t all that into swimming but they like to play around near the shoreline to help stay cool in the summer? We’ve got an option for that! Kurgo Surf N Turf Life Jacket: This jacket is great for shoreline activities. It has adequate flotation and some neat bonus features (e.g. a bottle opener) but doesn’t have a full belly panel which can mean lifting in and out of water may not be ideal. This jacket was put through the ringer in and out of water and has barely shown any wear and tear. This may sound like an odd category but some dogs can be body sensitive and will shut down if you put a jacket on them so you want something that either has minimal coverage or is light and flexible. EzyDog Dog Life Jacket: This life jacket is one of the few that we tested without a full belly panel and the main reason why it may be easier for dogs who are body sensitive. If your dog is used to wearing a harness then it should be a fairly easy and smooth transition to this life jacket for most dogs. 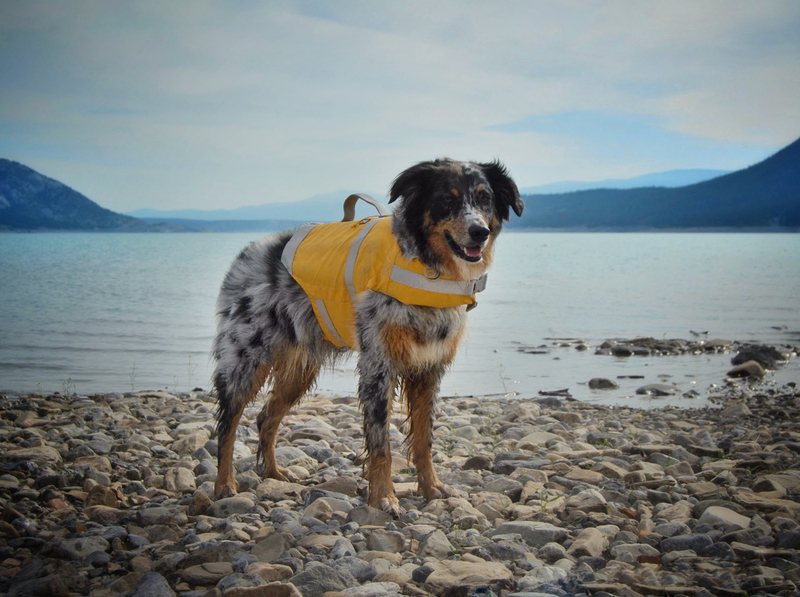 Hurtta Life Savior: We know we already gave this Best Overall Life Jacket but we had to add it in here again because it is one of the lightest and most flexible dog life jackets that we have ever seen. While it does have a full belly panel, the lightness and the construction of the jacket makes it a little easier for dogs to adjust to. Some dogs are natural born swimmers and the thought of a life jacket makes them scoff (or bork). But as a human, you know that they eventually will tire out. Why not give them a little something to allow them to expend a little less energy? Alcott Mariner Life Jacket: This life jacket had one of the sleekest fits of all the jackets we tested but it was designed to be an aid to for naturally good swimmers to allow less energy output. 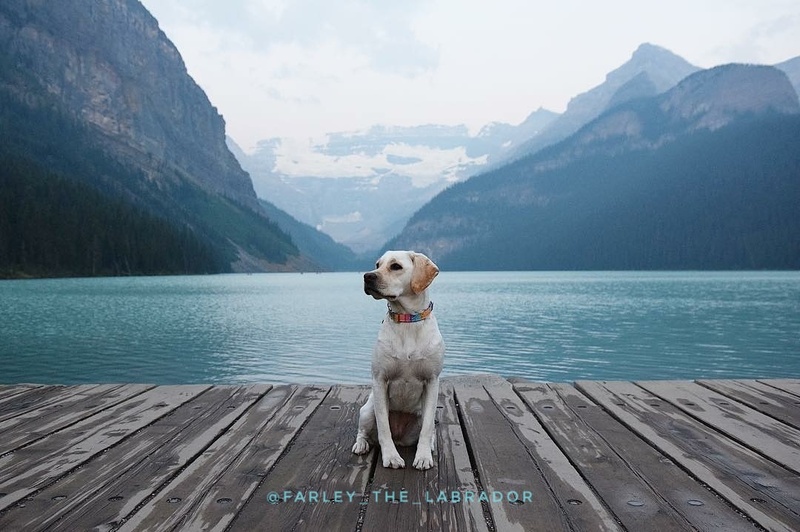 If your pup is a strong swimmer and you are looking for a little extra boost this may be the jacket for you. It wouldn’t be ideal for dogs who cannot swim or for lifting out of water. 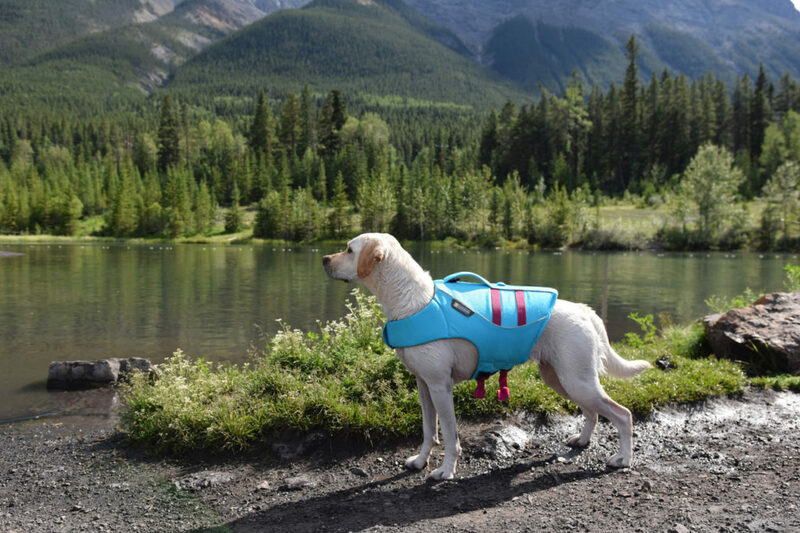 Cabela’s Advanced Dog Flotation Vest: The vest seems to be a good mid-range swimming aid and we wouldn’t hesitate to recommend it to someone who would need it a few times a year. 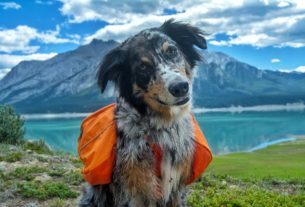 It’s easier on your budget than some of the top rated life jackets and will still do the trick for dogs who don’t need a lot of assistance or need to be lifted out of the water.